William STEPP [Parents] was born on 18 Mar 1827 in , Buncombe, North Carolina. He died on 14 Dec 1907 in , Johnson, Arkansas. William married Arminta NEWMAN in 1866 in , Buncombe, North Carolina. Arminta NEWMAN was born on 24 Jan 1848 in , Polk, North Carolina. She died on 7 Oct 1924 in Hartman, Johnson, Arkansas. Arminta married William STEPP in 1866 in , Buncombe, North Carolina. Reuben Sewell STEPP was born on 24 Nov 1867 in , Henderson, North Carolina. He died on 1 Apr 1898 in , Newton, Arkansas. He was buried in Buckhorn Cemetery, , Newton, Arkansas. M ii James Jonathan "Jim" STEPP was born on 28 May 1870. He died on 27 Jul 1963. John Thomas STEPP was born on 18 Aug 1872 in , Henderson, North Carolina. He died on 5 Jun 1945 in Eagle City, McCurtain, Oklahoma. F iv Agnes Adeline STEPP was born on 24 Nov 1874. She died on 18 Mar 1922. William Perry STEPP was born on 24 Mar 1876 in , Henderson, North Carolina. He died on 19 Aug 1957 in Jasper, Newton, Arkansas. M vi Joseph Aquil STEPP was born in 1879. He died on 31 Oct 1960. Nathan Lepear STEPP was born on 14 May 1881 in , Henderson, North Carolina. He died on 20 Nov 1952 in San Jose, Santa Clara, California. He was buried on 23 Nov 1952 in Morgan Hill, Santa Clara, California. F viii Mary Susan STEPP was born on 14 May 1881. She died on 21 Mar 1910. Honor Armintie STEPP was born on 29 Jun 1884 in , Henderson, North Carolina. She died on 6 Mar 1976 in Sanger, Fresno, California. Arner STEPP was born about 1886 in , Henderson, North Carolina. Harrison Martin STEPP was born on 14 Sep 1888 in , Henderson, North Carolina. He died on 31 Mar 1941 in , , Arkansas. 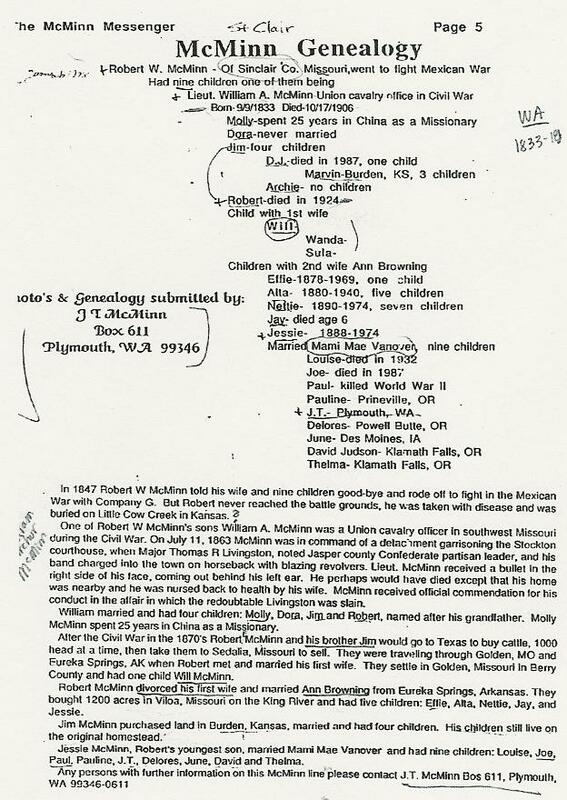 John Jackson MC MINN [Parents] was born in 1832 in , Buncombe, North Carolina. John married Nancy. Nancy. Nancy married John Jackson MC MINN.
John W. MC MINN was born in 1869 in , , Tennessee. John Wilburn BECK "Jr" [Parents] was born in 1840. John married Sarah Ann MC MINN on 7 Oct 1860. Sarah Ann MC MINN [Parents] was born in 1841. Sarah married John Wilburn BECK "Jr" on 7 Oct 1860. John W. BECK was born in 1861. M ii James F. BECK was born in 1862. LYDA was born about 1868. LYDA married Effie MC MINN.
Effie MC MINN [Parents] was born on 7 Jul 1869 in , Henderson, North. She died on 3 Oct 1950 in , , Mississippi. She was buried in Spring Hill Cemetery, Sturgis, Mississippi. Effie married LYDA. James F. BECK [Parents] was born in 1862. N. BECK was born in 1896. ---isa BECK was born in 1899. Robert William MC MINN [Parents] was born on 18 Jun 1799 in , Buncombe, North Carolina. He died on 15 Aug 1847 in Middle Springs, Sante Fe Trail, Glorietta Mts, New Mexico. He was buried in Glorietta Mountains, New Mexico. Robert married Elizabeth Pernetti "Betsy" CHAFFIN on 18 Nov 1826 in Shelbyville, Bedford, Tennessee. Elizabeth Pernetti "Betsy" CHAFFIN [Parents] was born on 19 Sep 1811 in Richmond, Henrico, Virginia. She died on 12 Apr 1900 in Stockton, Cedar, Missouir. She was buried in Stockton, Cedar, Missouri. Elizabeth married Robert William MC MINN on 18 Nov 1826 in Shelbyville, Bedford, Tennessee. M iv Lt. William Archer MC MINN was born on 9 Sep 1833. He died on 17 Oct 1906. F vi Harriet E. MC MINN was born in 1837. She died on 17 Oct 1906. M vii John MC MINN was born on 16 Jan 1840. He died on 2 Feb 1924. F viii Camelia Frances "Fannie" MC MINN was born on 24 Dec 1841. She died on 3 May 1915. F ix Mary Jane MC MINN was born on 13 Apr 1844. She died on 24 Nov 1933. Paralee MC MINN was born in 1845 in , Polk, Missouri. M xi Robert Edward "Ed" MC MINN was born on 21 Nov 1846. He died on 27 Feb 1925. William CLARK. William married Margaret MOORE. Margaret MOORE. Margaret married William CLARK. Nicholas MC MINN [Parents] was born in 1806 in , Buncombe, North Carolina. He died in 1851 in Stockton, Cedar, Missouri. Nicholas married Pena CULBERTSON on 1 Oct 1824. Pena CULBERTSON was born in 1813 in , Marion, Missouri. Pena married Nicholas MC MINN on 1 Oct 1824. Walter CLARK [Parents]. Walter married Cornelia S. CHAFFIN about 1837 in Liberty Gap, Tennessee. Cornelia S. CHAFFIN [Parents] was born about 1822 in Liberty Gap, Bedford, Tennessee. Cornelia married Walter CLARK about 1837 in Liberty Gap, Tennessee. Nicholas MC MINN [Parents] was born in 1806 in , Buncombe, North Carolina. He died in 1851 in Stockton, Cedar, Missouri. Nicholas married Cornelia S. CHAFFIN on 10 Jan 1839 in , Polk, Missouri. Cornelia S. CHAFFIN [Parents] was born about 1822 in Liberty Gap, Bedford, Tennessee. Cornelia married Nicholas MC MINN on 10 Jan 1839 in , Polk, Missouri. Paralie MC MINN was born in 1839. M ii William C. MC MINN was born in 1840. He died in 1910. F iii Margaretta E. MC MINN was born in 1842. M v John N. MC MINN was born in 1845. Robert S. MC MINN was born in 1848 in , Cedar, Missouri.